In a large bowl, with an electric mixer, beat together the egg whites, cream of tartar, and salt until foamy. Add the micro-ground coffee and 1 tablespoon of the sugar, beating until soft peaks form. Gradually add the remaining sugar and continue to beat until the meringue is stiff and glossy. Drop meringues by heaping teaspoons onto the prepared pans. Bake the meringues for 1 1/2 to 2 hours, switching the pans (top to bottom, bottom to top) halfway through the bake time. 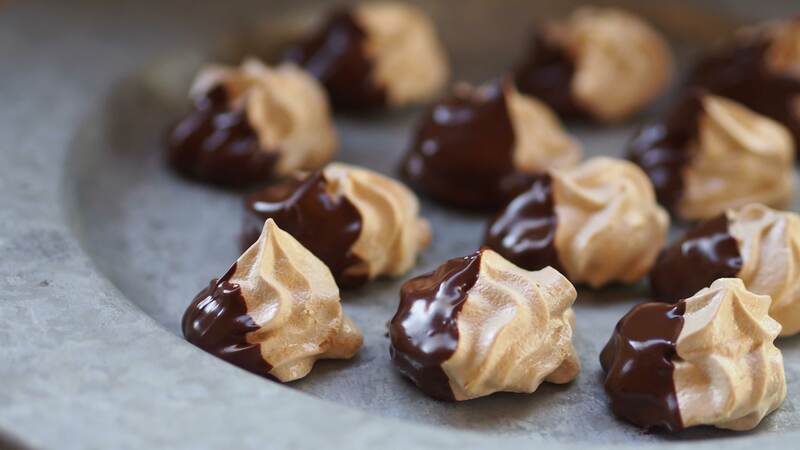 Turn off the oven, keep the door closed, and leave the meringues inside to cool and dry completely, 1 to 3 hours. Remove from oven; cool completely on baking sheets. In small microwavable bowl, microwave chocolate chips and shortening, uncovered, 1 to 1 1/2 minutes or until melted; stir until smooth. Dip half of each cooled cookie into melted chocolate. Place on waxed paper until chocolate is set. Remove meringues from paper; store in an airtight container at room temperature.